Something I’ve been asked more than once by non-travelers is – how do you afford to travel? A big part of the answer is: we use a travel rewards credit card. Granted, we don’t travel nonstop. We travel a couple times a year and then as much as possible locally, which helps keep wandering affordable. But the answer is twofold – we make it a priority to save in our daily lives so that we can afford to travel, and we get a boost from using a travel credit card. Because we need that boost! Having a kid ain’t cheap and neither is travel. Getting a free ticket makes a big difference! 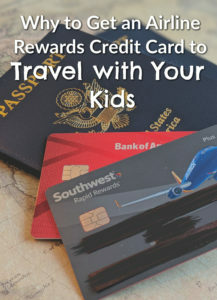 Whether you want to travel once a year or several times a year, the fact is that getting a rewards credit card is the way to go. When I first got mine, I had to take a bit of a leap in how I managed my finances. Prior to that, I didn’t use credit cards. Ever. I didn’t want to. But at the time, DaddyMonster and I were dating long distance and flying to see each other was getting to be a bit much. The answer was clearly that we needed to take advantage of a rewards program, and in order to do that, I needed to switch to using a credit card instead of a debit. What I do now is use a credit card for everything – groceries, utilities, household supplies. Anything I can use a credit card for, I use it. And then I pay it off every month. Obviously, you can pay it off or not pay it off. You do you. But when I do me, I pay it off. Points are based on how much money you spend with just about all cards, and those points go into your rewards account that you can then use to buy flights. Often, rewards points can also be used on hotels, car rentals, or even everyday items…but I’m in it for the free or discounted flights. This is where you might feel a little boggled as every airline has a rewards program (and sometimes a rewards program AND a rewards credit card), and so do lots of banks and other financial institutions. You can sign up for airline rewards programs sometimes without any investment at all, but it’s very slow to earn points that way as you have to actually fly to get the points and you have to fly A LOT to get anything. For instance, I signed up with Southwest’s rewards program back in 2001, but I didn’t actually start getting free flights until 2008 when I moved to the credit card. You can choose your program based on a few factors. Look at your nearest airport and figure out which airlines are hubbed there or which airlines most often fly places you’d want to go. 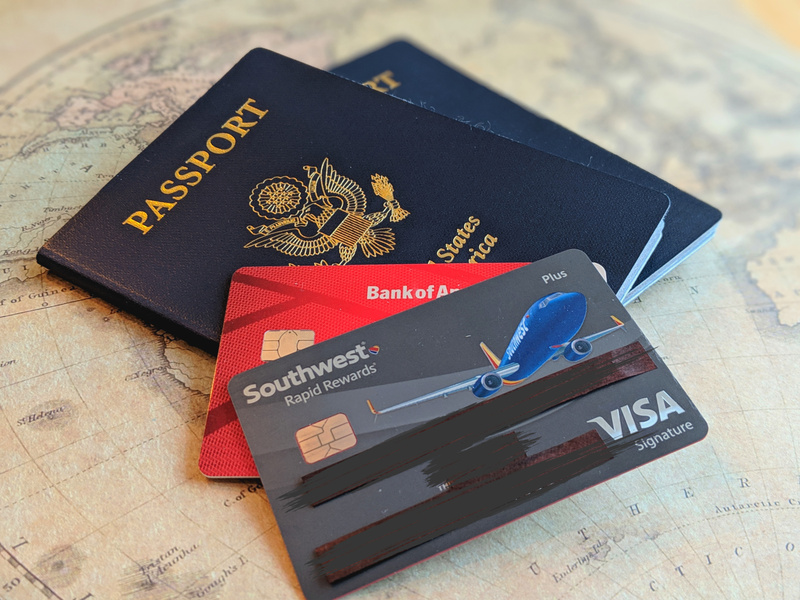 There’s no point in getting a rewards credit card with an airline you’ll never fly, so pick one that goes places you’ll go in the near future. Some rewards cards are airline specific, as in you can only buy flights on their airline or with their partners. Others earn points you can use on several airlines. Some, like Alaska Airlines or Southwest, let you earn points that you can spend like cash to buy their flights, meaning no black out dates. Others involve blackout dates or only certain times open for points use. Read the fine print and make sure there aren’t restrictions that would cramp your style. When choosing a card, also keep an eye out for sign-up bonuses. Often when you first sign up, you’ll get a big batch of miles you can use so long as you spend a minimum amount of dollars on the card within a set amount of time. Do watch out for annual fees. Almost all travel cards have an annual fee, and it can be worth it if you use the card regularly and get a free flight or two per year, but if it will be a while before you travel, make sure the fee isn’t something that would bum you out. If you’re flying, also listen to the flight attendant announcements…sometimes they will offer pretty sweet sign up bonuses right on the plane if you sign up for their cards at 35,000 feet. I’ve been a loyal Southwest card user for a long, long, long time. But I am likely going to switch as Southwest no longer offers many direct flights out of Seatac International Airport, and layovers with a toddler are not on my fun list. But the Southwest rewards program has been good to us. It’s super easy to use and not confusing at all. You get points that spend like cash and it’s great. Alaska Airlines is the next program up on my list. The airline offers a long list of flights out of Seatac and has not only an easy-to-use points system, but also a companion fare that you get each year. But do your research and find a card that works for you whether it’s a bank card or an airline card.